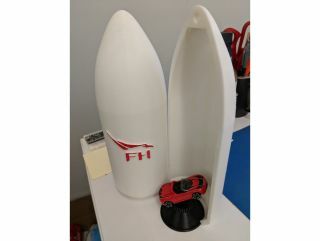 A 3D-printed model of the SpaceX Falcon Heavy rocket fairing, complete with a model car to represent the Tesla Roadster that flew on the real Falcon Heavy's maiden flight. The design is freely available via the website thingiverse.com. Just a few days ago, a Tesla Roadster soared into space aboard a SpaceX Falcon Heavy rocket, on its way to an orbit around that sun that could extend beyond the orbit of Mars. To commemorate the excitement of Tuesday's (Feb. 6) launch, you can 3D print your own version of the Falcon Heavy payload fairing. The model is just big enough to fit a Hot Wheels or Matchbox car inside. Instructions uploaded to Thingiverse — a website devoted to 3D-printed objects — detail how to create the Falcon Heavy fairing. The design was created by a San Francisco engineer named Paul, under the username "psync," who wrote a few assembly instructions explaining how to put the booster together and mount a toy car inside. The last step? "Launch to Mars," he wrote. A 3D-printed model of the Falcon Heavy payload fairing. The Falcon Heavy launch attracted worldwide attention while meeting most of its major objectives. Two boosters on the rocket successfully landed right side up, although the core stage missed its drone-ship landing pad and hit the ocean at 300 mph (480 km/h), SpaceX said in a press conference Tuesday following the launch. But it was the video livestream showing the Tesla and its spacesuited mannequin passenger, "Starman," that stole the show. Musk, who is also the CEO of Tesla Motors, chose to put the car inside the rocket to act as a test weight for the Falcon Heavy. While the car is intact right now, radiation will likely tear the vehicle apart in about a year, Live Science previously reported. A toy car mounted inside a 3D model of a Falcon Heavy payload fairing. Starman's name was just one of many pop culture references associated with the launch; the moniker references the famous 1972 David Bowie song of the same name. Part of the SpaceX broadcast of the launch featured another famous Bowie song, "Life on Mars." And instructions printed on the Tesla dashboard — "Don't Panic" — quoted a famous line from the Douglas Adams book "The Hitchhiker's Guide to the Galaxy" (Pan Books, 1979). In the near future, Falcon Heavy will focus on near-Earth missions. In 2018, it is expected to fly two missions: one to launch a large communications satellite called Arabsat-6A and another for the U.S. Air Force's Space Test Program 2, a launch that will include the LightSail 2 solar sail for The Planetary Society.